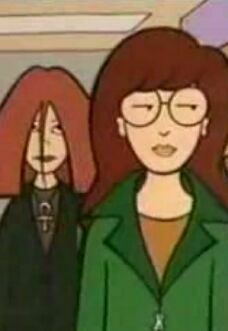 The first appearance of "Scarlett," standing behind Daria in "Esteemsters." Scarlett is the fandom-given name for a background character on the Daria show, a girl with long red hair dressed in gray and black, wearing an ankh on a necklace that gives her the nickname "the ankh girl." She first appears in the first episode of the show, "Esteemsters", as part of the group of new students taking the introductory tour (along with Daria and Quinn). From there, she makes regular appearances in the background all the way through to the final movie, Is It College Yet?. Scarlett was named after the online screen name of a member of the IUF, the Infamous Unserious Five whose numbers grew to somewhat greater than five, and also so named because of her red hair. She is the starring character in The Angst Guy's illustrated serial tale, "Scarlett." She has also appeared under the same name (as a shared character) in stories by fanfic authors hey, NightGoblyn, legendeld, among others. Because she has a pet white mouse named Roger in "Scarlett," the character is sometimes given the same pet in other fanfics (e.g., "Haunted" in "The Heather/Damsel Chronicles"). Scarlett has become one of the most-often used fandom-created characters in fanfic, though she still trails Veronica Morgendorffer by a wide margin. Scarlett's most common fanon surnames include Pendragon (first used by TAG), Hawkins (used by Doggieboy) and LeFaye (first used by The Sidhe, later used by The Excellent S). 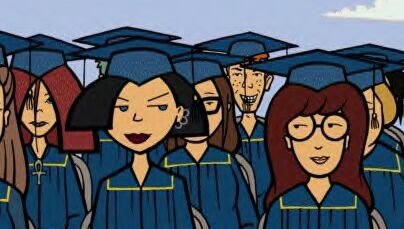 The last appearance of "Scarlett," sitting behind Jane in Is It College Yet? "Scarlett" The table-of-contents page for the serial story. Other fanfics in which Scarlett has appeared (sometimes named Scarlett, and sometimes with a pet white mouse which is sometimes named Roger and sometimes talks) include the following. This page was last edited on 28 April 2018, at 17:23.